The world has enough superheroes. One of Marvel’s most enigmatic, complex and badass characters comes to the big screen, starring Academy Award-nominated actor Tom Hardy as the lethal protector Venom. Venom was directed by Ruben Fleischer (Zombieland). 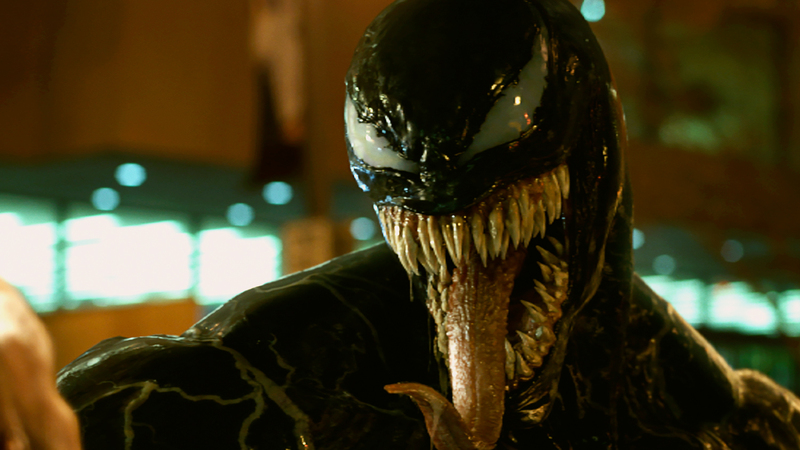 Scott Rosenberg and Jeff Pinkner wrote the first draft of the script for Venom, with later versions by Kelly Marcel and Will Beall. The cast includes Riz Ahmed, Michelle Williams, Jenny Slate, Reid Scott, and Scott Haze in as-yet-unrevealed roles. Woody Harrelson is also rumored to have a major role in the movie as the homicidal symbiote Carnage. Yes! Can’t wait for this! Not sure if that second sym was Karnage or not but it looked cool! You don’t really get the sense of horror from this trailer on a TV screen or laptop and definitely not on a phone. This trailer on the big screen was intense and menacing. Can’t wait! Carnage is NOT in the trailer, but that doesn’t mean he is not in the movie. They might be saving him. There are two different people shown being infected with a symbiote besides Hardy, but it could be two symbiotes or one symbiote failing to bond with the first and then bonding with the second. The first guy (with long hair) probably dies. The second guy (fighting Venom) is the doctor/scientist and his symbiote is probably RIOT. Riz Ahmed is playing Carlton Drake, who turns into Riot in the comic books and, apparently, in this movie. Woody Harrelson is on the cast list, but as an unknown character (could be Carnage).